How am I already closing in on the end of the second trimester? Time goes by so fast! Well, it does after the first 12 weeks of pregnancy. I flew in last Friday, not really telling many people, and hid at my sisters house. We had been planning this surprise party for my mum for months, and we were SO CLOSE to getting it right. A few more little white lies and suddenly it was party morning, we had 60 people coming, and a big room to prepare. It went SO well, she had absolutely NO idea there was a party as she walked into the room that afternoon, I hid in the kitchen area of the community center while she tried to soak it in for a minute, before going out there and kissing her on the cheek. She stared at me for about five seconds, unable to understand how I could possibly be standing in front of her, and then the tears started to come out the corners of her eyes. It was a wonderful afternoon with friends and family, and a very deserved one for someone who gives everything she has to her family and friends. So yes, I am in the UK for the next two weeks, and it is a really surreal feeling knowing that this really is my last trip home with just me. Next time I visit I will have a baby and life will be very different! 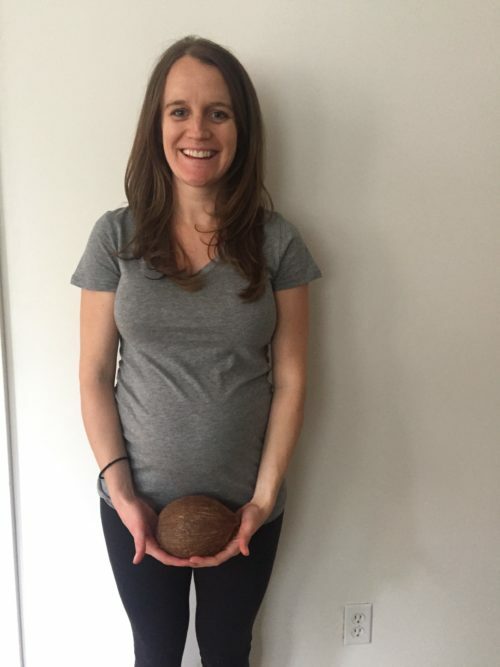 That really hit me at the party when many of the guests commented that the last time they saw me, I was all about my running, had just run for my country, and was very excited about my life ahead….and now I am pregnant, excited for a different reason! It’s funny, when I talk to people right now, I get a sympathetic “how are you?”, and it is almost like people are treading on eggshells, hoping I won’t launch into a long ramble about how hard being pregnant is. Those first 12 weeks were hard, no way around that, and I am very aware that the sun is setting on this somewhat easy street I am in right now, but the reality is, at this moment, I actually feel pretty good! I am more tired than usual, sleep more than I did before I was pregnant, and get some weird side symptoms, but overall, things are pretty good. It is strange bending over, or making certain movements now, as my belly gets in the way, kind of feeling like when you hit your finger, and it is swollen, but you try bend it, and it feels like its just tight and uncomfortable. That is how I feel sometimes now, like there is not enough room for the inside stuff to move. But the expanding belly is helping with that, and expanding it is…by the day I am getting better. We had our anatomy scan around the 21 week mark, which was amazing. You send a good 40 minutes in there, and they show you everything. I got to see her diaphragm, measure how long her femur bone was, see her liver and all the parts of her brain. It was just breathtaking to see it all, perfectly developed. They said everything looked good for her, and that was a huge relief knowing that the abnormalities they look for all looked okay. My placenta is at the front, what is called an anterior placenta, which is why I only felt kicks for the first time last week (SUCH an amazing feeling!) and although it is nothing to worry about, there are some MINOR increased risks for things towards the end if it stays there (although apparently it moves around), but for now, Dr Fuson was very happy with everything. My bump is pretty big now, unless I am wearing a baggy shirt, there is no real doubt that I am pregnant. I am really enjoying that aspect, looking down and knowing she is growing nice and strong. 23 weeks, well over halfway! The size of a grapefruit. Coming along now!! +10lbs at the 20 week scan. Right where she should be. Yep, they are definitely the most comfortable things for me right now. Initially I was thinking I would just wear my normal clothes, but they would stretch out a bit, and pull forward…however, I wasn’t thinking that as your belly pulls out, not only do your clothes stretch forward, but that forward pulls it up, meaning most of your shirts become belly shirts…with a nice little patch of skin showing underneath. So my stubbornness had to accept defeat, and I went to purchase some new maternity clothes to get me through. Mostly just basics like tank tops and another pair of maternity jeans, but for those of you, like me, who thought you would save money by not purchasing any new clothes…maybe it is possible, but for me, that was not the case. 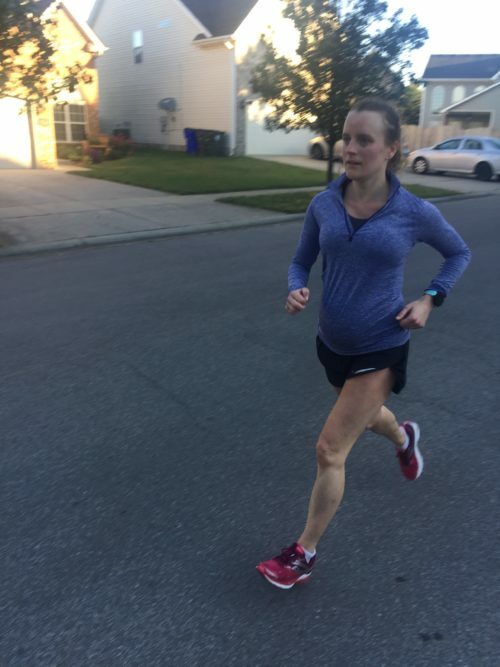 I cannot wear anything less than a medium in any of my running clothes on the bottom half, and even some of those are kinda snug, and everyday clothes, almost everything I wear now is maternity, the waistband just becomes a little too constricting. I still have my Snoogle Pillow and I actually had 2 nights without it in September, and they were by far the worst nights sleep I have had in months. So much so that I had Jess take another Snoogle Pillow with her back to the UK, so I would have one while I am here. I am still falling asleep by 9pm most nights, and Steve and I got into a good routine of sitting downstairs till around 8pm, watching an episode of friends in bed, and by the end of that, I fall asleep pretty quickly. Most nights I get 8-9 hours, some a little more than that, and some a little less. I am still kind of side/front laying, but making sure it isn’t putting too much pressure on my bump. I actually don’t find it too uncomfortable to lay on my back on the couch if my knees are up, so for now, I am continuing with that for little chunks of time. Often I feel her kicking me just before I fall asleep and when I wake up in the mornings, really enjoy just sitting there feeling for them at those times. Is this question best moment overall or best moment since the last update? I think I am going to have it as since the last 18 week update I posted. Either way, it would have been last week when I felt her first kicks. I was mid sentence talking to Sarah (Crouch), when I felt it, I froze, and knew that was it. It’s funny, all along I had been asking people what it felt like, what does that mean? Wondering was that it?! Was this it? But like everyone says, when you know, you know! So what did it feel like? A muscle twitch is the best way to describe it, when you get those random muscles that twitch uncontrollably. Although it’s not constant like a muscle twitch, it is a lot slower. The lower part also feels like the “drop” you feel as you ride a rollercoaster, at the end of the day, it feels like something is moving under your skin…which it is! I have had a few bouts of headaches when I overdid it trying to do too much. I find especially when it is hot, I can’t “push through” like I used to, and I have to learn to admit that I need to sit down and take breaks more than I usually would. Thankfully these have been few and far between, and a good nights sleep fixes it right up. Is still around, but kinda feels normal now. I feel silly complaining about being tired, when its just kind of how things are, and rightly so! I mostly only notice it in the evenings or if I haven’t had a good nights sleep the night before. The days I run are often more tiring days too. Haven’t noticed it as much, maybe just has become normal? I will get random pains in random places around my hips occasionally, usually they are sharp and shooting, but don’t last more than a few seconds. Seems like that would just be where things are stretching to make room. Not so much congestion anymore, but the feeling of when you are coming out of the other side of a cold, and there is a lot of….well, dried up stuff in there. Spend my mornings blowing that out ahah. I am ashamed, so ashamed. I was addicted to Pringles and I HAAATTTEEE that!!!! Pringles are one of the worst things I could be eating, but they are just SO. DAMN. GOOD. Especially the salt and vinegar ones. I limited myself to three cans, and have avoided them since, as I am not happy about what is in Pringles of all things, but as I said all along, I am craving them, so I will eat them. I am not gonna deprive my little one of what she requests. I have been enjoying homemade popcorn as a late night snack with Steve, although we had a few days in a row where we tried to make it, but kept burning the kernels over and over, despite trying it all kinds of ways. I ended up going to bed in a sulk one evening because I was so annoyed it didn’t work, and we had used up our last few kernels. I have said before that pregnancy cravings are like normal cravings on turbo, so once I got it in my head that I was having popcorn…then I wasn’t…I was not a happy camper haha. Not that it was steves fault, or that he meant to burn them, hormones, right? 😉 Poor Steve. I am still loving the tomato soup from before, I made it again a few weeks ago. As our Elmwood Farm Share gave us MOUNTAINS of tomatoes for weeks on end, it was easy to make an excuse for it. Again, I used this recipe on NY Times, and loved it! We are having a steak and ale pie for dinner tonight, that was at my request…not sure why, and I am pretty confident I have never requested a steak pie before, but it sounded good. Other than that, nothing too exciting. Still not liking fish very much, especially salmon, have to kind of choke it down when we have it. I still can’t stand green olives. Lying down comfortably and being able to go to a restaurant and choose the items with blue cheese or brie. Oh, and as I am home, cider. I LOVVVEEE having my cider (alcoholic, not the apple juice kind!). I can feel her kicks and I am officially six months pregnant! You can definitely tell I am pregnant now! Many people have been commenting that I do not look pregnant from the back, that it is a nice, neat little bump. Doesn’t feel that way to me as it’s so strange to see, but yeah, its obvious! Getting boring yet? Yes Snoogle pillow still wins the award for best purchase. I am applying the Burts Bee’s Mama Bee Oil for stretch marks, and enjoying various maternity clothes, mostly just Target basic ones. Enjoying wearing tight dresses, not tight as in I-can’t-breathe, but tight as in form fitting, comfortable material. I am enjoy those as they don’t cut off and dig in at awkward places like a pair of jeans would. I posted a few weeks ago about setting new goals when everything is completely different, and I did mention in there, that I ran 30 miles in a week. I actually did this twice, and although it wasn’t exactly easy only doing it in 4 days (to average 7.5 a day), it did feel good to get out there, and I wasn’t feeling “bad” either. Just was tired from running over an hour. I am still keeping it as slow as I need to, although I have abandoned using heart rate, as I just don’t feel like it is accurate for me right now, sometimes it will say my heart rate is 170 beats per minute (when in theory my max should be 191), but I am barely breathing hard at all. What I would consider a 6 on the effort scale. I have just been running what feels like 3-5 effort most days, and that seems to be working for me. Many days I feel tired, it’s mostly a slog, but not so much so that I need to stop, although when it was reaaaallly humid in Lexington again last week, I did stop halfway through my run a few times. Still keeping up with the strength training with Drew , and I do not intend on stopping. I have a post coming about why I will be doing it all the way and what I will be doing. I have set up a maternity shoot with Courtnie Coulson for December, and we are really excited about that. Don’t worry, they won’t be risqué ones! it was shocking to me the amount of naked photos people do…but that is not me! I love Courtnie’s work, and look forward to this! Otherwise, just planning on enjoying this time at home, and will update you again in the future! My oldest is 12 and I used the Snoogle pillow through pregnancy and postpartum. It was the best! I was sad when I had to throw it away after it was completely worn out. Try using a air popper for your popcorn. We love ours then also try spraying olive oil on the popped kernels as they are filling the bowl. We also add salt too of course!! How awesomely fantastic for your mum and entire family!!! That is amazing and I’m so happy you are home and soaking up the love you can only get from being home. Just wait until you return with your daughter! So many exciting things ahead for you!! It’s so amazing following her journey–I can’t wait to see photos of the baby, then the 1 year birthday mark, and then probably her running just like Tina one day! Also, if you want to take the bad hit off of pringles, maybe opt for baked chips instead? SO FUN! I am so so happy for you and you are pretty much the cutest pregnant lady ever. This is just the sort of update I have been craving. Can’t wait to hear about the strength training stuff. Best wishes! Tina, please, no need to be ashamed of craving Pringles. Your body is telling you it wants fat, calories, and salt. Be proud that you listened to your body and gave it what it wanted (in the midst of an overall well balanced diet). My pregnancy craving was McDonald’s (fried) fish sandwich and a milkshake. Cravings come and cravings go. Relax and go with the flow!